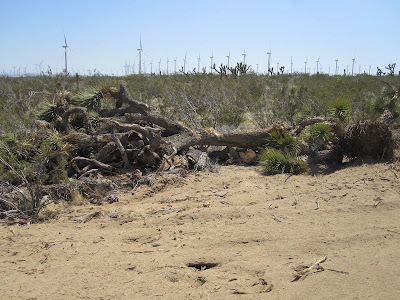 Terra-Gen Power has continued its expansive destruction of the western Mojave Desert as it adds nearly 205 wind turbines -- each over 400 feet tall -- replacing and industrializing a Joshua Tree woodland and creosote bush habitat on over 15 square miles. The expansion adds to Alta Wind Energy Center, which is one of the largest of a slew of wind projects approved or under construction in the area. Kern County approved the project despite concerns raised by residents and conservationists, adding to over 100 square miles of approved wind projects in the area. The massive wind projects pose a threat to California Condors and Golden Eagles, and require miles of wide access roads carved into the desert, fragmenting and destroying habitat. 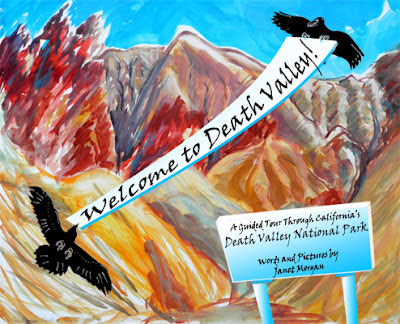 A new children's book by artist and author Janet Morgan -- "Welcome to Death Valley!" -- takes young readers on a colorful journey through Death Valley National Park, exploring its dunes, rocky mountains, critters and wildflowers. The desert can be a wondrous place, and Janet Morgan's book helps inspire that wonder by taking on what many perceive as a wasteland and revealing its fascinating life story. Using ravens as guides, the author takes a trip around the desert park, explaining geological formations, the tell tale clues of critter tracks in the sand, the colorful rocks of Desolation Canyon and Artists Palette, and the oasis of Darwin Falls. Mojave yuccas stand sentry just south of Searchlight, Nevada, with Spirit Mountain in the distance. Photograph taken at sunset in April 2012. This desert would be industrialized for 87 wind turbines over 400 feet tall, and miles of wide access roads carved into the landscape if the Searchlight wind energy project is built. "Hearsay." Storytelling. That is how somebody described Native American history in an attempt to urge approval for a massive solar project in the desert. The individual was urging the California Energy Commission to overlook the presence of sacred sites on the same land where BrightSource Energy plans to build an industrial solar facility near Blythe, California. But our history is not "hearsay." We are talking about centuries of cultural heritage and tradition. If you discard that, you have an empty future ahead of you. The fading light of the setting sun behind a creosote bush, just south of Searchlight, Nevada. This desert would be industrialized with dozens of wind turbines over 400 feet high for Duke Energy's Searchlight Wind Energy Project. 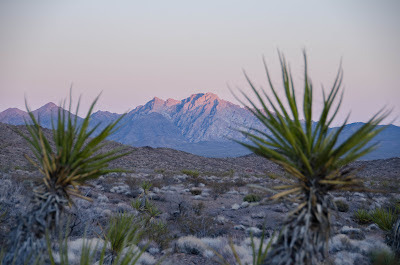 The BLM is currently accepting public comments on the draft environmental impact statement for the the Searchlight Wind energy project, which would industrialize nearly 30 square miles of ecologically intact desert habitat in southern Nevada. 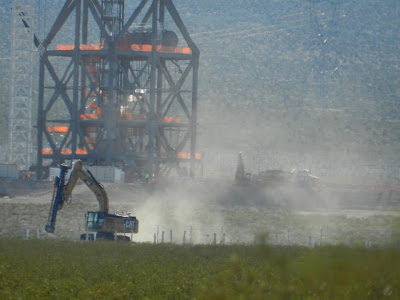 The wind turbines will pose a risk to raptors and migratory birds, the construction of new roads will kill or displace dozens of threatened desert tortoises and pose a continuing risk to the species through increased off-road vehicle activity. Public comments are due no later than 18 April to the BLM. For guidance and suggested talking points to use to craft your own comments, check out Basin and Range Watch's page here. As I mentioned in my last post on this, the EPA decided that clean air and health in desert communities and wildlands is less important than the profit margin of the coal industry. 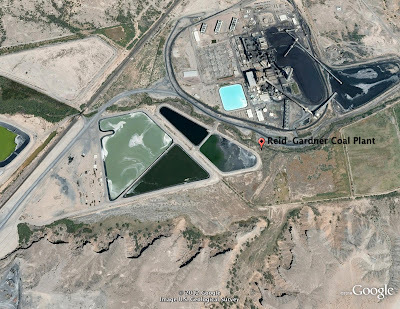 Instead of selecting the best available technology to reduce emissions from the Reid Gardner coal power plant northeast of Las Vegas, the EPA's proposed rule would let it use a less effective means primarily to reduce Reid Gardner's cost of compliance. Solar Mosaic has done it again! The organization successfully raised enough money through "crowd funding" for a rooftop solar installation in Flagstaff, Arizona. 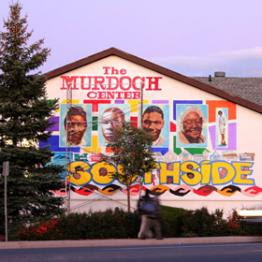 The solar panels will adorn the top of the Murdoch Community Center, saving them over $73,000 and cutting over 347,000 pounds of CO2. Solar Mosaic has completed funding for other rooftop solar installations in Oakland and the Navajo Nation. BrightSource Energy is planning its initial public offering (IPO) in NASDAQ this week. This company touts itself as a green messiah bringing us energy from the future, yet its business model is simply unsustainable because it requires vast tracts of land and amounts of water in an ecosystem that already shoulders many public burdens. And it does not help when they are running into conflict with State and Federal officials.